New York (TADIAS) — As a primary school teacher in Addis Ababa, Bruktawit Tigabu wanted to improve literacy skills not only for children in her classroom but also for those who had limited educational opportunities. In 2006 she launched Whiz Kids Workshop and developed Ethiopia’s first educational TV show for preschool kids entitled Tsehai Loves Learning, which is watched by approximately 5 million children and also broadcast in schools, refugee centers, and clinics. 25 million listeners also hear Tsehai Loves Learning via radio. The educational TV show is highly successful and has earned several international accolades including the Japan Prize International Contest for Education Media and Next Generation Prize at Prix Jeunesse International (2008) and Microsoft Education Award (2011). Bruktawit was named a Rolex Young Laureate in 2010. Following Tsehai Loves Learning Bruktawit released a TV series made by students called Involve Me in 2010. 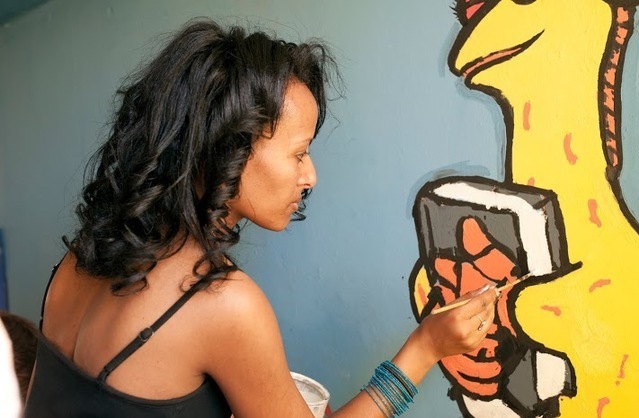 She was featured as one of the ‘Most Creative People of 2012′ by Fast Company and is currently running a crowdfunding campaign to launch her latest idea — building Tsehai’s Amharic Classroom Library Project and establishing 60 classroom-based libraries in several public elementary schools in Addis Ababa. Bruktawit’s dream is to have classroom libraries in schools across Ethiopia. TADIAS: Please tell us a bit about yourself and how you started Whiz Kids Workshop. What inspired you to develop it? BRUKTAWIT: I began my career as a teacher in my hometown of Addis Ababa. After a few years as a classroom teacher, I noticed most children entered the school system as late as age seven. This is because Ethiopia lacks public kindergartens. At Whiz Kids, we call this the early education gap and it is one of the main contributing factors to the high illiteracy rate in Ethiopia. These early years between ages three and six are developmentally critical to a child’s educational success; I knew something had to be done to fill this education gap for so many children. Whiz Kids Workshop began as an idea of how the power of television could close the gap. My husband Shane and I started out by making short films using some of the low-cost media technology that was becoming available to us at the time. We tested our films in classrooms and then conceived of the character of Tsehai, a curious young giraffe who loves books and music. Her show, Tsehai Loves Learning (Tsehai Memare Tewedaletch), has become a national hit that reaches millions weekly throughout Ethiopia on public television. Although our television show continues to reach and impact more and more children, we decided, a few years ago, to increase this impact by going beyond television into radio programming. This season, Tsehai’s radio programs will be reaching up to 25 million young listeners. We have also created Tsehai classroom libraries, where children and teachers can have a rich experience of our reading materials that include storybooks, workbooks, classroom posters and flashcards, developed by a large team of literacy experts, writers and artists. TADIAS: Can you share some highlights of achievements and lessons learned from producing the Tsehai Loves Learning educational series? BRUKTAWIT: Since we began in 2005, we have produced over 60 episodes of Tsehai Loves Learning that are viewed regularly by over 5 million children across the country. We continue to be the longest standing children’s TV series in the country. We have also been recognized for our work with over six international awards including Japan Prize in 2008, 2009 & 2010, Prix Jeunesse International – Next Generation Prize in Germany, 2010 Rolex Young Laureate award in Switzerland, and Microsoft Education Award 2011 of The Tech Awards in the USA. We recently won All Children Reading grant which helped us produce 32 episodes of Tsehai Loves Learning television and radio series. First, we never compromise on quality. Despite the challenge of producing for children, we have learned that to ensure and maintain quality—children’s production must be educational, fun, culturally and age appropriate, and relevant. To guarantee that we meet this standard, we spend close to a thousand hours of work for each episode of Tsehai Loves Learning. Besides the labor of love, we also use research, music, beautiful artwork and animation to bring it to life. Second, dedication and persistence is a must to overcome the daily challenges of being a pioneer of such innovative work in Ethiopia. We face numerous challenges including financial, human resource capacity in the field, and bureaucratic hiccups on a daily basis. But we have learned that when we stay focused on our goal—reaching the millions of children who eagerly wait to see what we are producing and the vision of a better Ethiopia because we are providing children’s education– we are incredibly energized to persevere. Third, building community — We have learned that no development or growth is sustainable or successful without the involvement of its community. We believe that every child in Ethiopia deserves the very best educational materials, regardless of their economic background. That’s why we are so excited to be reaching out to Ethiopians across the world to make this campaign succeed. TADIAS: You recently announced the launch of an innovative crowdfunding campaign for an Amharic Classroom Library Project. Please tell us more about the initiative. Is this also in conjunction with the TV series? BRUKTAWIT: Reading is a foundational skill for all learning in school. In some regions of Ethiopia, according to the 2010 Early Grade Reading Assessment, a majority of children have 0% comprehension, even at the end of grade 2. The same research showed that having teachers who provide focused reading instruction and story books, are a promising approach for identifying and beginning to remedy this critical problem. This is the reason we are building Tsehai classroom libraries beyond our TV and radio programs; to ensure sustainable reading success, the reading materials must be in the children’s hands. Each classroom library revolves around a set of powerful elements that achieve reading success. Our classroom library materials includes 32 full-color, original storybooks that focus on one of the families of Ethiopian fidel; 32 beautiful classroom posters of all the fidels; 297 illustrated flashcards for learning the fidels; a wall-mounted sleeve used for teaching the fidels; five shelves for displaying the books, mounted at the right height for children to reach; and a mural featuring the beloved character Tsehai to create a special space for reading and exploration. We also include teacher training videos to demonstrate to teachers how to these materials in the classrooms most effectively. Our initial goal will be to establish 60 classroom libraries in public schools in Addis Ababa. But if we go beyond our initial $25,000 goal it means we will be able to reach more schools in the country. The new season of Tsehai Loves Learning is fully integrated into this initiative. Each of the 32 new episodes of the show features one of the books as an animated short within the show, with the characters reading them along with students and using the flashcards to learn the fidel. We will be including these episodes in each classroom library set on eight DVDs. TADIAS: What is one thing you absolutely enjoy about running Whiz Kids Workshop? BRUKTAWIT: I love to see people’s reactions to our work. It never gets old for me to see children sing along with Tsehai as they watch the show or to see a teacher’s reaction to the new classroom set we have developed for them. Most Ethiopian children know and love Tsehai; today’s teens grew up with her and adults keep telling me how much they wished for our materials to have been available when they were growing up. TADIAS: Where do you hope to take your organization in five years? BRUKTAWIT: Over the next five years we will continue to produce more innovative episodes of Tsehai Loves Learning that help children develop capacities in literacy, science, math, the arts, and moral values. We are going to keep building our library of books and supplementary materials, not only in Amharic, but in other Ethiopian languages. We want to create a nationwide movement based upon an appreciation of the importance of reading as the foundation of success in education and in life! This campaign is the beginning of raising awareness among parents, teachers, and school administrators to elevate the importance of helping children fall in love with books and learning to read by putting the right kind of learning materials into their hands. I can also see the Tsehai brand expanding beyond the borders of Ethiopia to develop curriculum in other African languages. TADIAS: Is there anything in particular that you want to share with Tadias readers? BRUKTAWIT: Having lived in the U.S. for a few years with my children, I know how hard it can be to maintain our language and culture while we are away from Ethiopia. We all know how important it is for us to help our children stay connected to our people and our heritage while we are far away, but it isn’t an easy task when they are immersed in another culture and strongly influenced by it. With this new campaign, we are reaching out specifically to Ethiopians living abroad and giving them two important ways to meaningfully strengthen their connection with their country and people. By becoming contributors to our campaign, they will be the very first to get access to our new set of books, videos flashcards and posters to enjoy with their family. At the same time, they are making a direct contribution to the improvement of quality education in Ethiopia – critical to the development of our country.